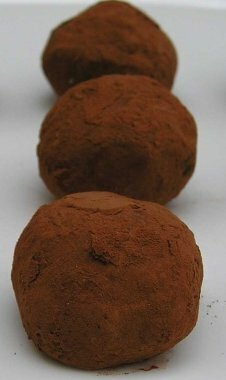 Orange Blossom Infused Chocolate Truffles are extremely easy to make and they are also so versatile with the flavor combinations only limited to your own imagination. I love the combination of orange and Grand Marnier infused into these chocolate candies. These luscious Chocolate Truffle are made using a basic ganache using a high quality chocolate and heavy cream. Recipe courtesy of Ellen Easton. Check out more of Ellen Easton’s Tea Travels™ articles and recipes. More delicious Candy Recipes and Chocolate Recipes. * If eggs are a problem for your family or in your area, just omit the egg yolk from the recipe. In a small saucepan over low heat, combine butter and cream; heat until the butter melts and the cream bubbles around the edges. Remove from heat. Add the chocolate; cover and let stand until chocolate melts. Stir melted chocolate until smooth. Mix in the egg yolk until well combined. Mix in orange peel, citrus peels, and Grand Marnier. Cover and refrigerate until firm. Scoop out 1/2-ounce balls of the chilled chocolate mixture and roll into balls (about the size of a Bing cherry). Roll the balls in the cocoa powder and place them on a baking sheet covered with either parchment or wax paper and refrigerate until firm. Store in the refrigerator in an airtight container. Will hold for 2 weeks.